Very few trees reliably change colour in autumn in Perth so to a see a decent display we need to either head for the hills or travel south. I have been lucky enough to have been down to the Blackwood River Valley three times in the last couple of months and to have seen a gradual progression from mid to late autumn (autumn here is from 1 March until 31 May). 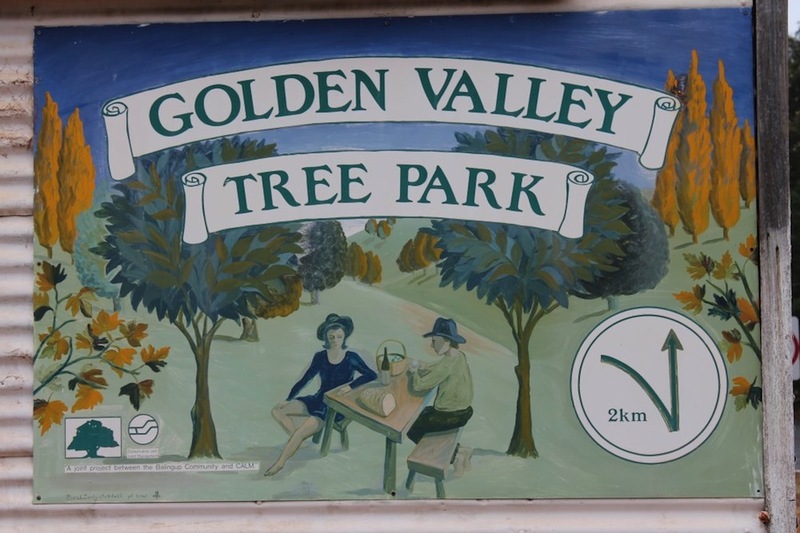 One of my favourite places to visit there is the Golden Valley Tree Park where you can see a wide variety of trees which colour up in autumn. 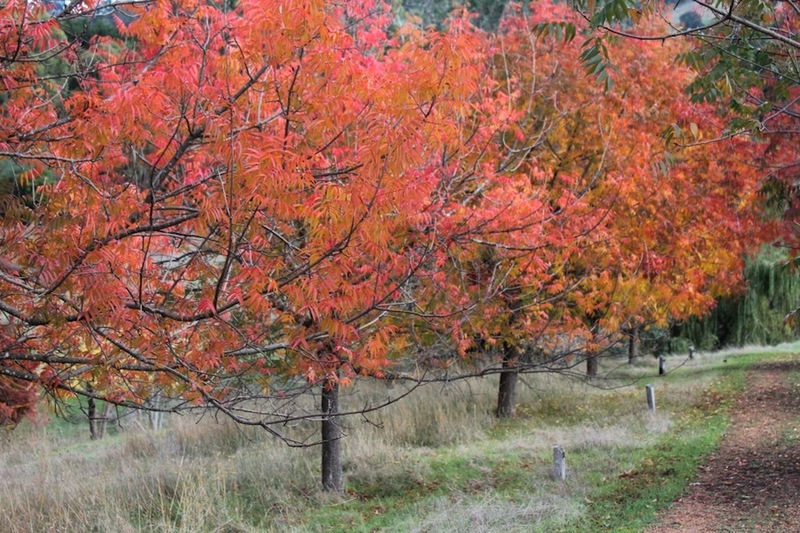 Nestled in the hills of Balingup, it is the largest arboretum in Western Australia. The land that forms the park was destined to become a pine plantation but the objections of the local community meant that it was saved and an arboretum was created in 1980. Two farms (Golden Valley and Yungerup) had existed on the site and the trees planted by the farm families form the core of the northern hemisphere specimens. New trees are planted each year and there are now over one thousand different tree species growing in the park which is divided into the two sections – the World Collection which contains many deciduous trees and the Australian Collection. Not all of the trees in the World Collection are deciduous as conifers are also well represented and there are other evergreen species scattered throughout the Collection. I am embarrassed to say that even though I have visited the World Collection many times I have never been to the Australian Collection. Obviously I’m feeling a bit guilty about this and have vowed to rectify the situation on my next trip. During our visit in early April the Easter lilies, garden escapees from the old farm gardens, were blooming alongside the road into the park. The trees in the World Collection were still clothed in shades of green and the grass was golden and brittle. A beautiful 30 year old quince (Cydonia oblonga) tree was festooned with fury pale green fruit and white blossom still hung on a nearby crepe myrtle (Lagerstroemia). 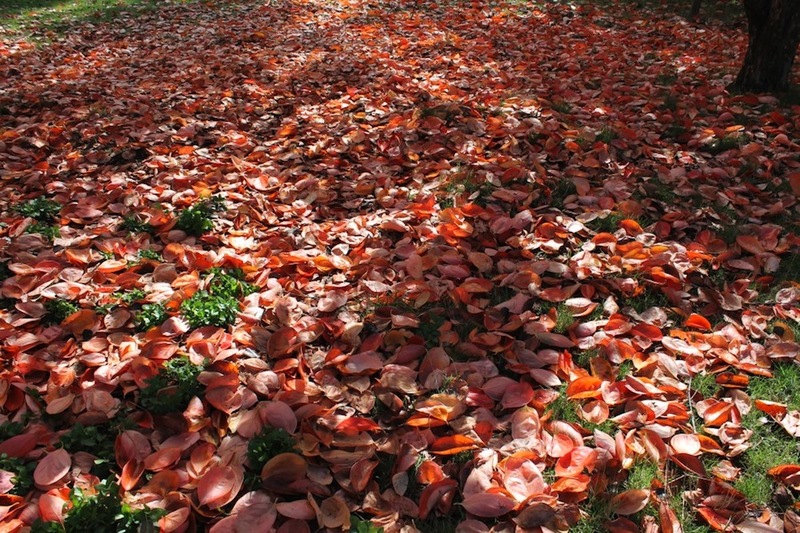 Just 6 weeks later, in the middle of May, the broken remnants of the bleached grass protruded from a soft carpet of new grass and vibrant reds, yellows, oranges and purples replaced the green foliage of the deciduous trees. What a transformation in such a short time. A magnificent old Irish strawberry tree (Arbutus unedo) was covered with bunches of luminescent lantern shaped flowers. Unfortunately its label was missing so I’m not sure exactly how old it is but it must surely be one of the original plantings so it could be around 100yrs old. When I was looking on line at the list of trees available for sponsorship in the park. 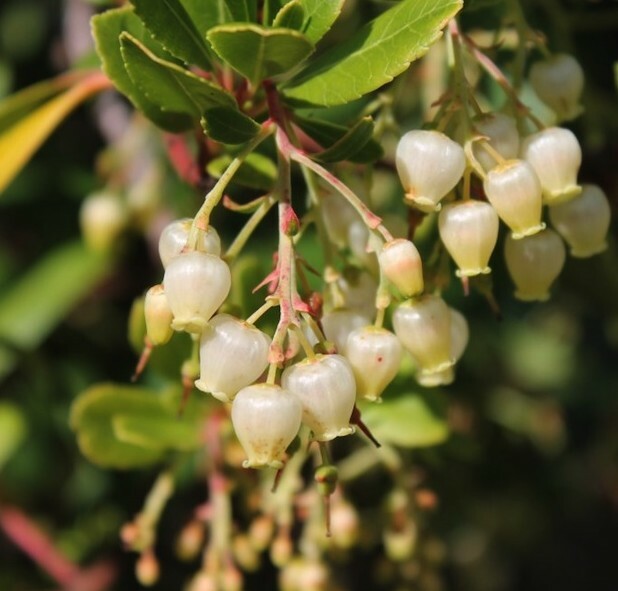 I noticed that there were three other Arbutus species growing there which was a bit of a surprise to me as I have only ever heard of the Arbutus unedo growing in WA – I guess that is one of the benefits of visiting an arboretum – you get to see rare and unusual trees. My favourite trees on this visit would have to be the persimmons (Diospyros kaki) planted in 1904. Their glowing leaves are in stark contrast to the black tortured branches and beneath their canopies islands of newly sprouted vinca emerge from a sea of sunset coloured leaves. There is a large collection of oaks, many of which are rare in Australia. 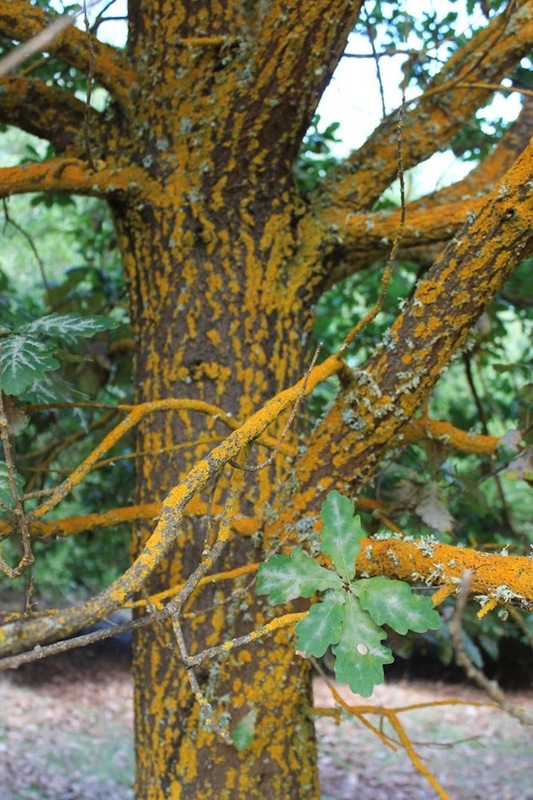 The Mediterranean oak (Quercus lusitanica) is quite young (planted 1988) but it looks much older due to the growth of acid yellow lichen covering much of the trunk. 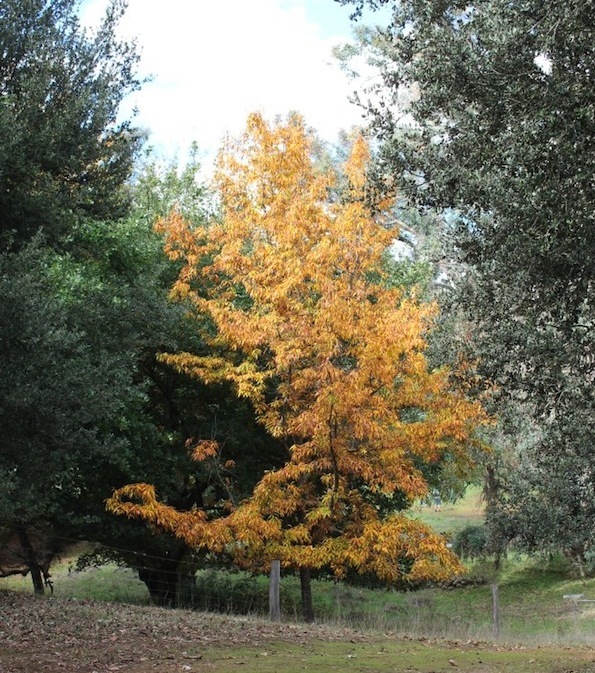 The chestnut leafed oak (Quercus castaneifolia) with its deep golden foliage looked stunning. 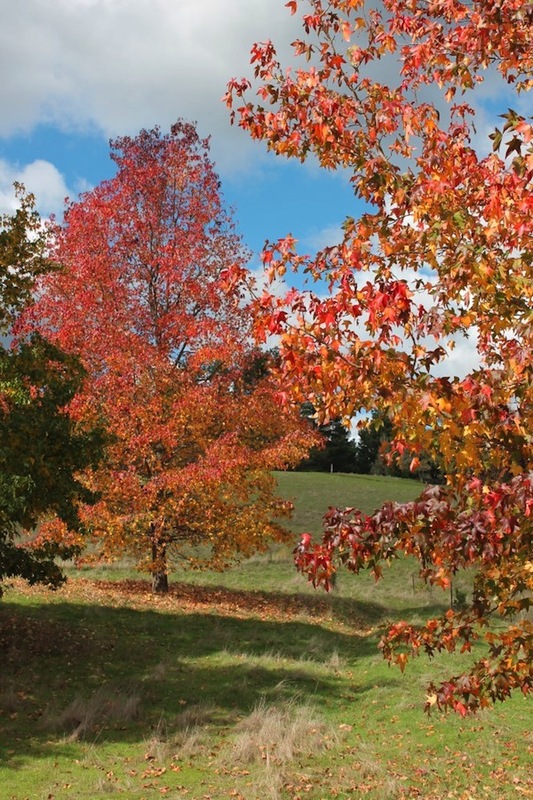 Others trees that caught my eye with their colourful displays were the maples (in particular the trident maple), claret ashes, liquidambars, pistachias, poplars and zelkovas. Although an autumn visit to the Golden Valley Tree Park is very rewarding there is still a lot to see in Park and surrounding areas at different times of the year. 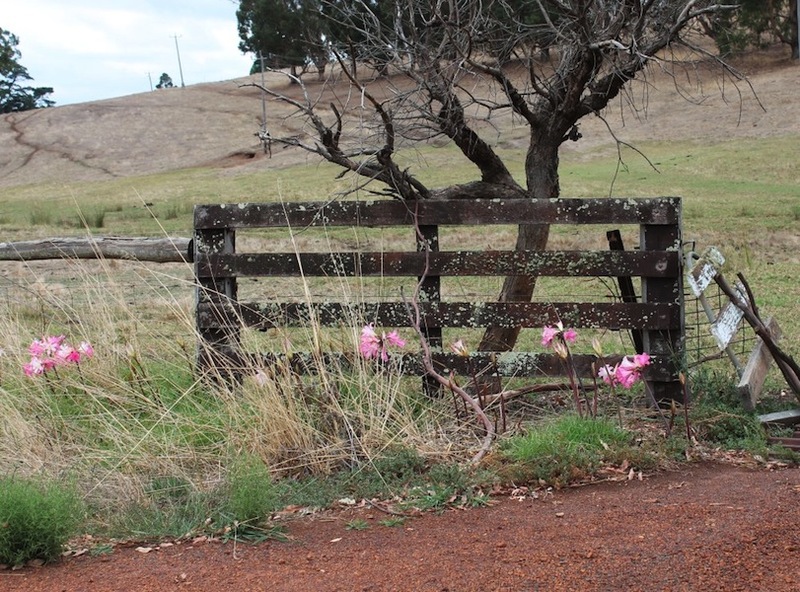 The Festival of Country Gardens has a full program of garden visits in both spring and autumn and the Nannup Flower and Garden Festival in August coincides with the blooming of the tulips. A number of gardens in the district can also be visited at various times through Open Gardens Australia. 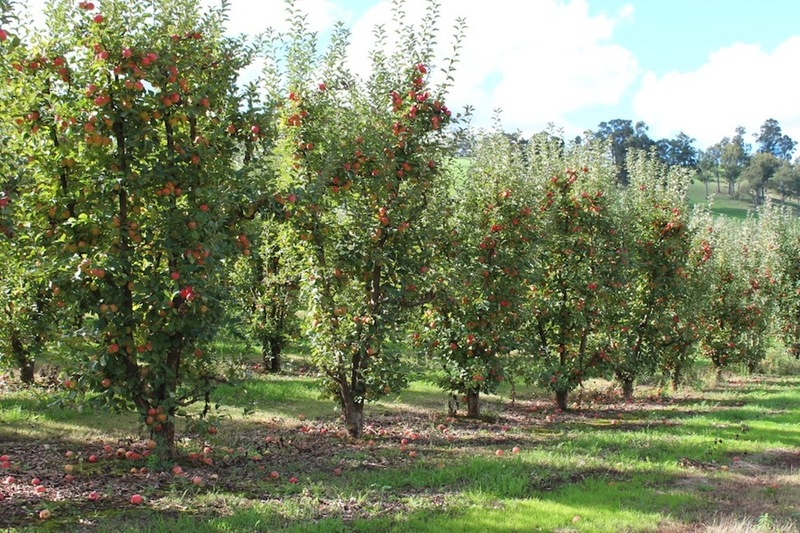 The Blackwood River Valley has produced delicious fruit and vegetables for many decades but it is now becoming a notable producer of wine, cider and truffles, with a truffle festival being held at Manjimup in late June. Buying fresh fruit directly from the orchards on the way home is a real treat. Near Donnybrook we bought juicy stonefruit and pears in mid autumn and crisp new season’s apples in late autumn. I think next year we will plan a winter trip to coincide with the harvesting of the truffles! And of course that would be a perfect time to visit the Australian Collection of the Park if I haven’t been in the meantime! Such beautiful trees and interesting post, Linda. We were in the area in February, but sadly did not know to visit this park. Aren’t the pistachia trees glorious and the sea of persimmon leaves spectacular? Has to be on our must see list next time we are in WA. What a shame you missed it Julie. 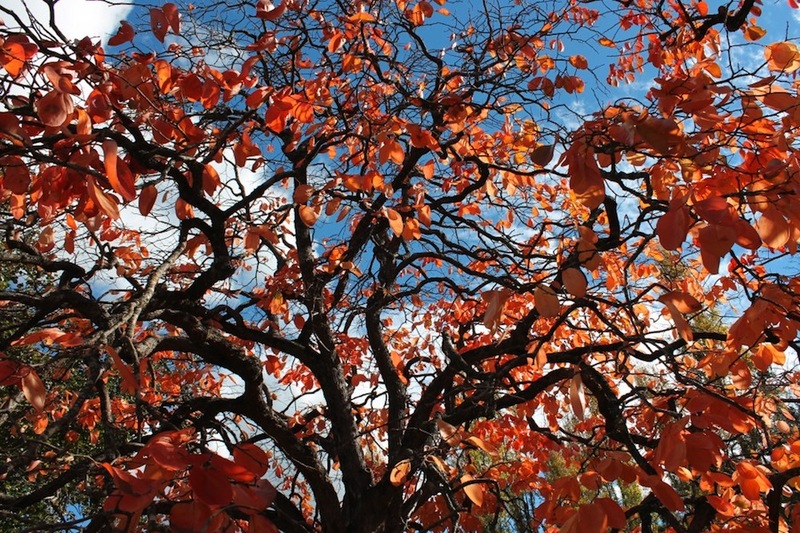 For those of us who live in warmer climates it is great to know where to see trees in their autumn glory.